Most of the temples celebrated some or other festival in almost all the months. Some important festivals such as Chithirai thiruvila, Masimagam and Pankuni thirunal were celebrated for several days. Special days such as Vaigasi Visakam and Markali Thiruvathirai attracted celebrations in some temples. Karthigai peruvila was a noted celebration of some temples such as Tantonrisvaram and Uyyakkondanthirumalai. Vaikuntha Ekatasi formed a grand occasion at Vaishnavite shrines especially at Srirangam. Rich endowments in the form of land, gold and money from people of different social stature helped the temple management to meet out additional expenses incurred during festive occasions. Visitors and ascetics of different orders were served food on almost all these days. Distinguished sacred baths, special services with grand offerings mentioned in the inscriptions as perunthiruvamuthu were provided to the deities. Special mandapas existed in several temples to conduct such ceremonial services. The processional images of the temple were taken around along the four immediate streets to facilitate people to have closer darshan. It is understood from the sculptural representations of such processions depicted in temples such as Darasuram, Thiruvalisvaram, Thiruchennampoondi etc. that the processional deities were carried by the Sripathamthangis on their heads on such occasions. Palanquins and chariots were also used for such processions and special personnel were appointed to carry the extra load of work. A record from Srirangam throws light on the procession taken place during the month of Aippasi. 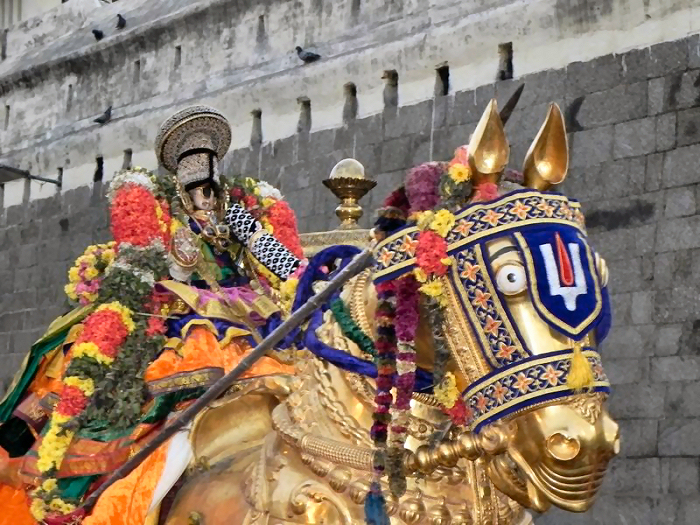 Alagiyamanavala Perumal, the processional deity of the temple was taken in the temple car on that occasion. A nine day festival mentioned in the record from Anbil throws light on nine individuals with whom the responsibility of conducting the festival was entrusted with by the sabha. Each one of them was made responsible for one day of the festival and the expenses were to be met out from the produce of the gifted land meant for that endowment. Most of the Saivite temples of Thiruchirappalli district had week long celebrations during the month of Chittirai. Special lamps were burnt by the local shepherds at Thirunedungalam on that occasion. Dance dramas such as Bhuvanasundari Kalyanam and Nedungala puranam were enacted. 25 Siva yogins were fed every day for all the seven days. Chitirai festival was celebrated for nine days at Rock-fort temple with special endowments made to feed brahmanas, sivayogis and tapasvins. Festival in the month of Vaikasi covering the day of asterism Visakam is reported in many records. 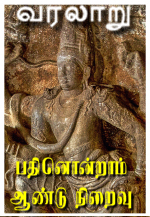 Two records from Uyyakkondan Thirumalai describe in detail the events taken place during the festival. Presiding and the processional deities of the temple were given sacred bath with the Kaveri water. The presiding deity was adorned with new cloth and decorated with sandal paste. Special services and offerings were made to both deities. Processional deity named as Uyyakkondar received special decorations and was taken to thiruvolakka mandapam for public darshan. Endowments of different kinds covered expenses of the festival and also helped to feed the devotees and ascetics who thronged the places through out the festival days. A temple car procession highlighted the Aippasi festival at Srirangam. The deity was provided a special treatment before and after the processions. It is understood that sacred water was distributed to all the devotees at the end of the procession and the deity was transferred to the shade of Punnai tree where Tettaruntiral, sonnets from Prabandam was sung to the deity and after which was offered appam. Endowments of land pieces from different categories of people were made to look after the special offering and the car festival. A record of Viraramanata from Srirangam throws light on the Karthikai festival celebrated in the month of Karthikai on a grand scale. The presiding deity of the temple was smeared with civet ointment (puluku) on this occasion and was provided a very special service and offerings along with distinguished decorations. Ponnambala Mahadeviyar sister of Viraramanata provided the land to support the festival. Several records speak about this grand festival, celebrated in the month of Masi in most of the Saivite temples. Thirupparaithurai and Adikudi temples paid special attention to this festival wherein it was celebrated respectively for nine and seven days. 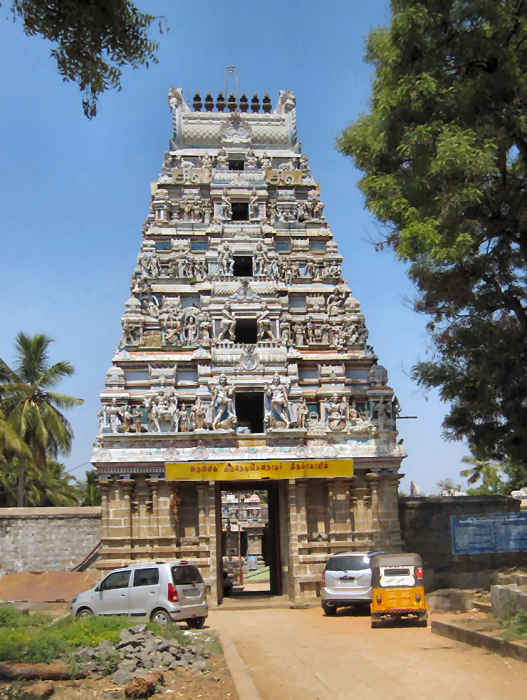 Since the festival is centered on the asterism Magam, gift of land was made during the reign of Rajaraja I at Thirupparaitturai temple to provide special offerings with four kalam of rice as perunthiru amutu to the presiding deity on that occasion. Lands were also gifted to feed the sivayogis and vellala tapasvins on all the nine days of the festival. Third regnal year inscription of Parakesari from Adikudi registers gift of land by an individual to feed twenty five brahmanas on all the seven days of the festival celebrated in the month of Masi. Panchami in the month of Masi was celebrated at Srirangam with appam, a special dish provided to the presiding deity. The endowment that covered the celebration was made by Thennavan Madevi, the queen of Kulottunga I.
Pankuni celebrations are age old and a poem from Agananuru mentions about it. It was celebrated highlighting the star Uttiram in several temples including Thiruvanaikkoyil and Srirangam. Generally as in any other festival the deities were provided special decorations and distinguished offerings. Perunthiruvamudu, a grand meal is made out of 8 kalam of paddy to offer to the deity and to be distributed to the devotees who visited the temple on that day. On the fifth day of this festival the god was provided with appam as special offering. Brahmadirajan of Peruvenkur had gifted a portion of his land to support the fifth day expenses including offerings. The same individual had gifted 135 kalam of paddy to celebrate thirumulaipuluti tirunal on the day of Rohini during this festival. His endowment covered sacred bath, perunthiruamudu, appam and cloths to the gods along with acharya dakshina to the bhattacharyas. A hunting festival crowned the festive fervor during which occasion the processional deity was taken on a horse vahana to a nearby mandapa to aim a few arrows against an imaginary demon. At Srirangam this ceremony was conducted both during Aippasi and Pankuni at Arikandadevan mandapa constructed by Arikandadevar, one of the generals of Kulottunga I. The god was provided aval amudu, a special delicacy after the hunting festival. Festivals formed the major events of a temple in unifying the society and providing job opportunities to the less privileged. Special feeding programmes carried out on such occasions had taken care of the visiting devotees and the ascetics. They also injected fresh energy in the temple administration and attracted significant patronage.